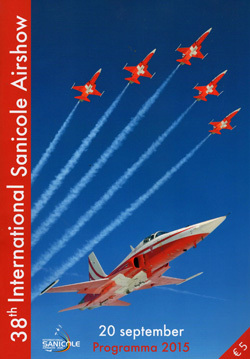 The International Sanicole Airshow is one of the very best airshows in Europe, if not the world. Precious few other airshows present such a big and varied flying programme on a single day. Even more remarkable is that the venue for such a show is not a sprawling civilian airport or military base, but a small aeroclub on the outskirts of a typical Belgian market town. It attracts military and civilian participants across Europe for an eight hour flying display that this year included two national military displays teams, fast jets, warbirds, aerobatics and a couple of really quirky and entertaining acts. Paul Johnson/Flightline UK reports. All photography by the author. Video by the Sanicole Airshow Media Team. Sanicole Aeroclub sits just outside the market town of Leopoldsburg in the Limburg region of Belgium. It is typical of many European general aviation fields with a few small hangars around a central clubhouse and a short runway. It is however next to a large army camp and just 10 minutes’ drive away from the major Air Force base at Kleine Brogel. For much of the year, it is home to general aviation and flying training, but in most Septembers it becomes home to one of Europe’s most prestigious airshows that is on the ‘must-do’ list for enthusiasts and participants alike. The showground is quite long and thin sandwiched between the runway and the trees than line the main road outside. As with any major show, the showground is home to a number of stands, but there is definitely much more emphasis on aviation than seen at UK shows. Two areas that stood out this year were exhibition areas for Eurofighter Typhoon and Rafale International. Belgium is currently weighing up its options to replace its aging F-16 fleet. The F-35 Lightning II may be seen as the favourite with Belgium’s close ally the Netherlands already committed to the type, but other companies are still pushing hard. Both the Rafale and Typhoon promotional teams were at Sanicole and they were each handing out branded baseball caps. Much to the amusement of the crowd, it all got rather too serious with caps being swapped over by each party so they could take photos showing how popular their brand was! There iwas action in the sky from the get-go with large R/C models displaying right up to the start of the main flying displays. Some of these were most impressive including an Embrear Tucano with a real model turboprop and some very realistic Pitts Specials. One unusual aspect of the Sanicole Airshow is that it always has commentary in Flemish and in English. Flemish commentator Chris Christiaens was joined by Ric Peterson from Canada. Ric has commentated at many great aviation events across North America and certainly was enjoying his Sanicole experience going by his enthusiastic commentary. It is a big flying display touching on eight hours in length with just a short lunch break. Opening the display was Belgian aerobatic pilot Luc Coesons flying his Pitts S-2C Special G-INDI in exuberant style in the early clear blue skies. Plenty of solo aerobatic action followed throughout the day with a variety of different machines. Following on from his appearance during the Sunset Airshow on Friday, Jean-Marc d’Hulst flew the Trescal sponsored Stolp Starduster Too. Much more potent machinery was displayed by Pierry Marmy flying the Breitling Sukhoi Su-26 and Belgian Air Force F-16 pilot Kristof Cloetens flying a CAP 232. Joining the solo aerobatic acts were a host of more civilian teams. Painting some very colourful trails over the blue Belgian skies was the Pioneer Team from Italy flying a quartet of Alpi Pioneer 300 light aircraft. The Victors Formation Team are a stalwart of Belgian Air Displays flying four Piper PA-28 Cherokee aircraft. The team, which is based at Ursel, performs some gentle but very precise formation passes during their display which does a great deal to highlight general aviation to the Belgian public. Completing the line-up of civilian display teams were Team Raven from the UK. Flying a mix of a sole Vans RV4 and four Vans RV8 the team filled the skies with some big formations and synchronized aerobatics. Also over from the UK was Brendan O’Brien with his highly modified Piper J3 Cub. Sadly for the sunset show, a technical gremlin prevented him from presenting his full pyro show. However, Friday’s loss was Sunday’s gain as he fired multiple fireworks and smokes during his daytime display to great effect. Another very unusual and incredible display came from Hugues Duval in his electric powered Columbian Cri-Cri. Earlier this year, Hugues and his tiny aircraft beat the might of Airbus in completed the first cross-channel flight by an entirely electric powered aircraft. However, perhaps the most extraordinary aspect of Hugues display is how he get airborne! Hugues and the Cri-Cri launches from on top of a Max Holste Broussard utility aircraft before then performing some close formation passes for the crowd highlighting the huge size and power difference between the two aircraft. However the star turn amongst the civilian acts for the crowd was the display by Melissa and Rex Pemberton. The Husband and Wife team participate in a wide range of outdoor sports but are perhaps best known for Aerobatics and wingsuit flying respectively. For their display at Sanicole Rex jumped from Invicta Aviation’s Shorts SC7 Skyvan which was trailed by Melissa in her Zivko Edge 540. Once he had jumped and was cleared for the Skyvan, Rex tracked down the display line with Melissa barrel-rolling around his smoke trail and together with Ric Peterson, provided a commentary on the descent! Once Rex was on the ground, Melissa put on a stunning solo aerobatics routine to end one of the most memorable displays of the weekend. There was plenty of historic aircraft in the flying display. The RAF Battle of Britain Memorial Flight made an increasingly rare international appearance with the Douglas Dakota III. The aircraft was in Europe for the Operation Market Garden commemorations and took in Sanicole on its teturn leg to the UK. The Royal Netherlands Air Force Historic Flight also participated with the familiar duo of North American TB-25N Mitchell and Supermarine Spitfire IX which displayed as a pair and solo items. Somewhat less regularly seen is the Stichting Exploitatie Catalina’s Consolidated PBY-5A Catalina. This aircraft is thought to be the oldest Catalina still flying and wears the attractive all-over silver markings of the Royal Netherland Air Force. One of the highlights of the show was Remko Sijben’s newly imported Commonwealth Aircraft Corporation CAC-13 Boomerang. The aircraft was Australia’s first indigenously built fighter aircraft and this particular airframe is currently the only airworthy example. The type came about as the Royal Australian Air Force requirement for fighters could not be met with exports from the UK and America. It is certainly a punchy performer and is even fitted with a smoke system to highlight its display. Post war piston power came from the North Ameican T-28 Trojan flown by Kris van den Bergh and the Cessna O-2 Skymaster from the Postbellum Foundation. Kris and his T-28 are regulars at Belgian air events, and it is nice to see an example of the Post War trainer wearing US Navy colours. The Postbellum Foundation is a relative newcomer to the European display circuit and aims to highlight the Cold War Period. The 0-2, which wears its authentic markings from the Vietnam War Period, is just the first in what could be one of the Europe’s most exciting collections. The only Belgian Air Force fixed wing aircraft to operate from Sanicole were the three SIAI-Marchetti SF260s of the Red Devils display team. Reformed in 2011 from the Hardship Red Formation Team, the Red Devils have become a firm fixture at European airshows presented some very precise formation aerobatics. The Kleine Brogel F-16AM Fighting Falcon force appeared throughout the day. A chance early-morning QRA scramble meant two F-16s were able to perform a quick fast fly-by very early in the display. A display unique to Sanicole is that of the “Thundertigers” from No 31 Squadron. This is a four-ship of F-16s presenting a wide range formation passes and tactical maneuvers for the crowd including some spectacular flare releases. As is almost a tradition at Sanicole, the Belgian Air Force solo F-16 Demo was the penultimate act of the afternoon with Cdt Tom “Gizmo'” De Moortel showing off the incredible agility of the 40 year old design. Further F-16AM Fighting Falcons came from the Portuguese Air Force for a very rare flying display appearance from the air arm. Two F-16s performed some brief but noisy flypasts towards the end of the morning flying display. Though sadly the Royal Netherlands Air Force does not have an F-16 display in 2015, it did send its AH-64D Apache solo team to Sanicole. As with their display on at the Sunset Show, the Demo Team made superb use of flares throughout their display which proved very popular amongst the crowd. There was a superb collection of international Fast Jet displays on offer. The Swiss Air Force sent its solo McDonnell Douglas F/A-18C Hornet while the French Air Force sent the Dassault Rafale C display to the event. The latter appeared with Smokewinders and a garish Green Tiger Scheme emblazoned on the aircrafts upper surfaces. For the enthusiasts, the pair of Sukhoi Su-22M Fitter-K strike fighters from the Polish Air Force were perhaps the stars of the day even if their display did seem a little distant at times. Though the Polish examples are currently going through an upgrade program, the sight of true cold war jets from the Eastern Bloc is an increasingly rare one, particularly in the west. The Sukhoi Su-22 has great presence, particularly when igniting the reheat which produces a characteristic ‘thud’ when it kicks in. As with the Sunset Show, the main airshow day also enjoyed the participation of two big national military display teams. First to appear and also provide the formation of the day was the Swiss Air Force’s Patrouille Suisse flying six Northrop F-5E Tiger II fighters. Their formation saw them tuck in behind the glorious Lockheed Super Constellation supported by Swiss Chronographer, Breitling. Together, they made an impressive noise as the growl of the big pistons was slowly drowned out by the jets on each pass. The Patrouille Suisse’s full display was as superb as ever with added bonus of multiple flare releases throughout their display; such a shame we don’t get to see such a spectacle at UK shows! The finale to the show was the Italian Air Force’s Il Frecce Tricolori. The team are celebrating their 55th Anniversary in 2015 and the team’s Aermacchi AT-339PAN aircraft sport a revised colour scheme celebrating the Red, White and Green of the Italian flag. Sanicole is a special venue for the team as the Limburg region is home to a number of Italian ex-pats and their display commentary was broadcast live on a local Italian-speaking radio station. The ‘Frecce’ were in fine form presenting the most spectacular display of the weekend in the early evening light and drawing the show to a stunning close. Very few other airshows in Europe present such a varied mix of displays, and the 38th edition of the International Sanicole Airshow did not disappoint with perhaps it strongest line-up of recent years. As ever the event was incredibly well organized and along with the Sunset Airshow and Spottersday makes for an hugely weekend of aerial entertainment.